BORN in Brittany, France, Malo Camus may not have always been a Celtic supporter, but his love for the club now is very much evident. 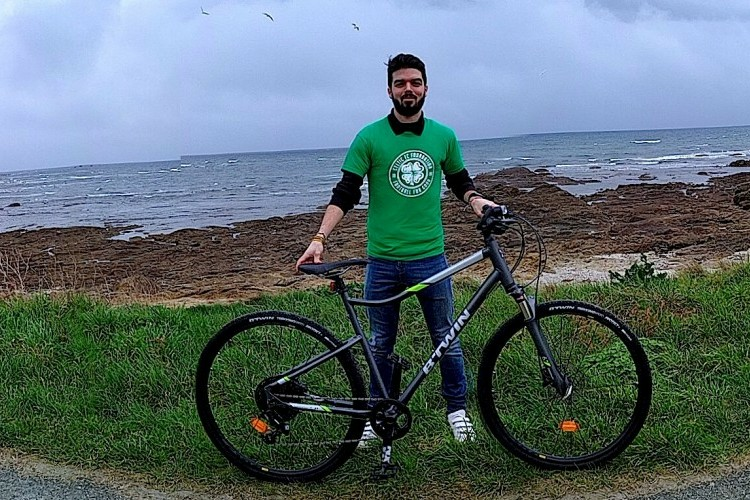 So much so, that he has decided to take on the enormous challenge of cycling around 800 miles, from his hometown in Brittany to Celtic Park, this March. Brittany, in the Northwest of France, is one of six territories considered as the Celtic nations. As a big football fan with Celtic roots, Malo has had a keen interest in Celtic Football Club from a young age. Malo said: “I began following Celtic back when I was eight-years-old. Celtic played Bordeaux in the UEFA Cup, so there was a lot of coverage about Celtic in the French press at the time and that’s when I first discovered the club. As a Celt myself, I was instantly interested in Celtic and I was absolutely amazed by the passion around the club. “After that I began finding out more about the incredible history of the club and followed the results. It became my dream to attend a match at Celtic Park. “In 2017, through my university studies, I was given the opportunity to study for a term in another country on the Erasmus programme, and I was delighted to do this at the University of the West of Scotland. Their Sports Development programme is excellent, but studying there also gave me the chance to be closer to Celtic. While in Scotland, Malo became familiar with the work of Celtic FC Foundation. Having recognised the importance of the club’s charitable traditions, he was keen to offer his support. He added: “Celtic is an institution recognised and respected all over the world, not only for its football on the pitch but also for its charitable heritage. I witnessed the fantastic work of Celtic FC Foundation and I really wanted to make my own contribution. Malo plans to set off on his journey on Wednesday, March 20 with the aim of arriving in Glasgow in time for Celtic’s SPFL clash with Rangers on Sunday, March 31. Proud of his Celtic roots, Malo has planned his cycle route to allow him to explore as many of the Celtic nations as possible. This will see him cycle through Brittany, Cornwall, Wales, Ireland and Scotland. He has been undertaking regular cycles, and plans to continue to build up his training regime as he moves closer towards the challenge. Through his efforts, Malo is aiming to raise upwards of £1,500 which will be donated to support the work of Celtic FC Foundation. He added: “This is the first time I have raised funds for charity so I am just looking to raise as much as possible. I know it will be put to great use by Celtic FC Foundation.